Selling psychology is always involved when is comes to real estate. You are sending your potential buyers messages, whether you know it or not! Make sure you are sending the right message! Discover what you are telling them in our latest blog post! To really understand your buyer, you must know who they are. While you don’t want to stereotype, you can educate yourself on the demographics of your area. Are there more families or more singles? Recent grads or older, retired couples? Think about who your buyer is likely to be. Picture them and even give them a backstory! Think about what they’re going to want to see in a home they purchase and give them that! And if you feel intrusive, you won’t feel comfortable, and if you don’t feel comfortable, you aren’t going to make an offer. Personal items make people viewing your home feel intrusive and like they are somewhere they shouldn’t be. This is NOT the vibe you are trying to give off! They need to be able to picture themselves in the house, and that might be difficult with your wall of bowling trophies or the life-sized family portraits. Clean up all personal items and any clutter laying about. Don’t leave paperwork out or pictures on the fridge. You want to home to feel clean, inviting and relaxed. Buyers aren’t going to want to come in and make a ton of changes. A family with small kids isn’t likely to make an offer on a pool home with accompanying cactus garden. If families are a dominant market segment in your neighborhood, you might want to keep them in mind and make safety precautions when making upgrades to the home. On the flip side to this, having Princess Elsa murals in the kid’s room might subconsciously deter a retired couple. People need to easily be able to imagine themselves in the space. Having a more plain and neutral room, allows their imagination to easily picture them in their new office, or guestroom. Think with your buyer in mind when you are getting the home ready for showings! Keep the house fresh, clean, warm and sleek to attract the highest number of potential buyers! Sometimes people have multiple uses for one room. For example, a guest room and office space. Or a gym and playroom. This is practical and functional for your family. 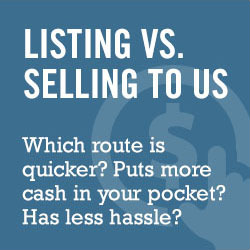 However, to potential buyers, it can subconsciously be confusing and overwhelming. A defined office is a place someone can picture themselves in easily. And if they choose, they can imagine changing into something else. But let them think about different options for the space on their own. Defining the rooms will make the home feel more orderly, organized and appealing. Properly staging your home is a critical factor if you are looking for a fast sale at the price you want. A lack of order, tidiness, and neatness can give off the vibe that you are apathetic when it comes to your home. If you don’t take care of the things people see on the surface, what else are you not taking care of? Well planned staging tells people that you take pride in your home. This adds perceived value and will tell potential buyers that you have taken care of the property.